Modern electrical motors are available in many different forms, such as single phase motors, three-phase motors, brake motors, synchronous motors, asynchronous motors, special customised motors, two speed motors, three speed motors, and so on, all with their own performance and characteristics. For each type of motor there are many different mounting arrangements, for example foot mounting, flange mounting or combined foot and flange mounting. The cooling method can also differ very much, from the simplest motor with free self-circulation of air to a more complex motor with totally enclosed air-water cooling with an interchangeable cassette type of cooler. To ensure a long lifetime for the motor it is important to keep it with the correct degree of protection when under heavy-duty conditions in a servere environment. The two letters IP (International Protection) state the degree of protection followed by two digits, the first of which indicates the degree of protection against contact and penetration of solid objects, whereas the second states the motor’s degree of protection against water. The D-end is normally the drive end of the motor. The N-end is normally the non-drive end of the motor. Note that in this handbook we will focus on asynchronous motors only. In this chapter the focus has been placed on the squirrel cage motor, the most common type of motor on the market. It is relatively cheap and the maintenance cost is normally low. There are many different manufacturers represented on the market, selling at various prices. Not all motors have the same performance and quality as for example motors from ABB. High efficiency enables significant savings in energy costs during the motor’s normal endurance. The low level of noise is something else that is of interest today, as is the ability to withstand severe environments. There are also other parameters that differ. The design of the rotor affects the starting current and torque and the variation can be really large between different manufacturers for the same power rating. When using a softstarter it is good if the motor has a high starting torque at Direct-on-line (D.O.L) start. When these motors are used together with a softstarter it is possible to reduce the starting current further when compared to motors with low starting torque. The number of poles also affects the technical data. A motor with two poles often has a lower starting torque than motors with four or more poles. Three-phase single speed motors can normally be connected for two different voltage levels. The three stator windings are connected in star (Y) or delta (D). The windings can also be connected in series or parallel, Y or YY for instance. If the rating plate on a squirrel cage motor indicates voltages for both the star and delta connection, it is possible to use the motor for both 230 V, and 400 V as an example. The winding is delta connected at 230 V and if the main voltage is 400 V, the Y-connection is used. When changing the main voltage it is important to remember that for the same power rating the rated motor current will change depending on the voltage level. The method for connecting the motor to the terminal blocks for star or delta connection is shown in the picture below. A motor always consumes active power, which it converts into mechanical action. Reactive power is also required for the magnetisation of the motor but it doesn’t perform any action. In the diagram below the active and reactive power is represented by P and Q, which together give the power S.
The ratio between the active power (kW) and the reactive power (kVA) is known as the power factor, and is often designated as the cos φ. A normal value is between 0.7 and 0.9, when running where the lower value is for small motors and the higher for large ones. 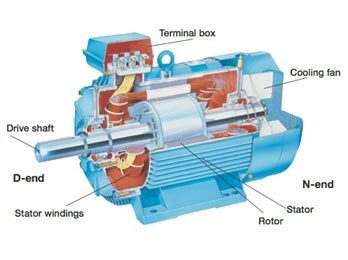 The speed of an AC motor depends on two things: the number of poles of the stator winding and the main frequency. At 50 Hz, a motor will run at a speed related to a constant of 6000 divided by the number of poles and for a 60 Hz motor the constant is 7200 rpm. This speed is the synchronous speed and a squirrel-cage or a slip-ring motor can never reach it. At unloaded condition the speed will be very close to synchronous speed and will then drop when the motor is loaded. The starting torque for a motor differs significantly depending on the size of the motor. A small motor, e.g. ≤ 30 kW, normally has a value of between 2.5 and 3 times the rated torque, and for a medium size motor, say up to 250 kW, a typical value is between 2 to 2.5 times the rated torque. Really big motors have a tendency to have a very low starting torque, sometimes even lower than the rated torque. It is not possible to start such a motor fully loaded not even at D.O.L start. In some cases when a D.O.L start is not permitted due to the high starting current, or when starting with a star-delta starter will give too low starting torque, a slip-ring motor is used. The motor is started by changing the rotor resistance and when speeding up the resistance is gradually removed until the rated speed is achieved and the motor is working at the equivalent rate of a standard squirrel-cage motor. In general, if a softstarter is going to be used for this application you also need to replace the motor. The advantage of a slip-ring motor is that the starting current will be lower and it is possible to adjust the starting torque up to the maximum torque. Please assist , i would like to find out how to calculate and set the overload for any particular motor. Fo example a motor rated at 315 amps,250 kw at 525 volts. Thank you for the valuable guidance found in this posting. This helped me troubleshoot a new crane hydraulic power unit motor controller that was wired incorrectly on our vessel. Thank you for allowing me to visit your website.